From the iconic Ford Mustang to the top-selling Ford F-150, the Ford Ranger, and the popular Ford Focus, Ford’s offers something for everyone. With a full line up of new cars, trucks, SUVs, crossovers, and hybrids, there is no shortage of style and class. Owning a Ford car is one thing, but personalizing its look to match your personal taste and style is another thing altogether. Get started with PVD black chrome rims for your Ford at Wheel Creations PVD. PVD chrome wheels are the ultimate upgrade that any car owner would dream of when they want to set themselves apart from other drivers on the road. 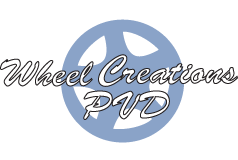 At Wheel Creations PVD, we know that having that unique and personalized look is easy to achieve when you know what you want. We provide you with a variety of Ford chrome rim finishing options, including the widely popular black chrome rim finish, PVD bright chrome, PVD onyx chrome, and other PVD specialty colors. Want to get a new set of black chrome wheels for your Ford car? Talk to our experts today and get your wheels in advance without any delays. We strive to make sure that our valued customers get exactly what they want - a beautiful new look for the car at a fraction of the cost. Request a quote today for a new set of black chrome rims for your Ford.